Editor's Note: Has Tech's Time Come to Social Work? Over the past several years, Social Work Today has increased the amount of technology-related content in its print/digital issues. I admit that it has been with some doubt and resistance on my part. As you can see by the gray hair in my photo, I am not a digital native but an immigrant, and my knowledge of technology has not come naturally. Because our readership is a professional group whose skills are based on human interaction and clinical acuity, I had questioned whether they had great interest in technology topics. After conferring with advisors and professionals in the field, I decided it was wise to start including technology-based content in our publication, as technology is part of every aspect of contemporary life, even in a profession as "high touch" and not "high tech" as social work has traditionally been viewed. 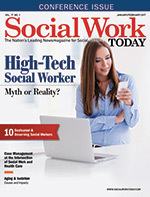 Our cover story, "High-Tech Social Worker — Myth or Reality?" reflects the doubts of some social workers who have been traditionalists in their practices. The story asks whether the high-tech social worker is a myth or reality. Many in the profession say, yes, the high-tech social workers are a reality. Their beliefs are based on the fact that social workers are effectively using technology in their practices. However, the question of whether it may be a myth comes from the reality that pockets of the profession may not be keeping up quickly enough or are closed to using digital tools. There are some social workers who lag behind in tech adoption or are fearful and stuck in old ways of doing things. We recognize professionals who may be apprehensive about how technology will change social work practice, but they must know there are very human social work interactions that technology may never equal. And it is precisely those very human skills that likely brought the 10 Dedicated & Deserving Social Workers to the attention of the colleagues who nominated them and why they were selected for this issue. Every year we receive many nominations of dedicated and deserving social workers and we select 10 to honor in the first issue of the year. We hope you will enjoy reading their stories as much as we have.